The Beatles. Citizen Kane. Muhammad Ali. Many have laid claim to being the "best ever" in their respective fields of work, but only one can top the list. And the same is true when it comes to technology. So what's the best tech product to come out of the digital age? And what qualifies a product as being "best"? First and foremost, it must be a quality product. In many cases, that means a piece of hardware or software that has truly changed our lives and that we can't live without (or couldn't at the time it debuted). Beyond that, a product should have attained a certain level of popularity, had staying power, and perhaps made some sort of breakthrough, influencing the development of later products of its ilk. 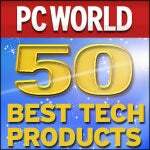 So after considering hundreds of products and engaging in many hours of painstaking debate, PC World presents the 50 best tech products. Note that we're looking only at technology that has arisen since the dawn of the personal computer, so don't expect to see the cotton gin and the transistor radio on the list. Instead, you'll find gear that, in all likelihood, you used yourself at one point or another--and, in many cases, products you're still using today. And, oh yeah, you may think our choices are ridiculous or that we've left out much more important products. Have at us. Smack us down righteously. You can comment on the story and give us your views through the comments section on the bottom of every page OR go directly to this story's forum. And don't forget to vote on the product YOU think should be number one. Reader Poll: What's Your Pick for Best Tech Product? Marc Andreessen may have known what he was getting into when he cowrote Mosaic at the National Center for Supercomputer Applications, but it wasn't until he graduated from college and met with some Silicon Valley types that the Web revolution really began. In 1994 Andreessen launched Netscape Communications, offering his new Navigator Web browser (based on Mosaic) to the world. Finally, users outside of the academic world would get a taste of HTML, and nothing has been the same since. Netscape was the reason people started spending hours a day on the Internet, leading to the boom (and bust) of many a Web site. The advent of the browser also led to the U.S. Department of Justice's antitrust suit against Microsoft, after the company embedded Internet Explorer into Windows. And Netscape's August 9, 1995, IPO is universally considered to be the official start of the dot-com era. Netscape, unfortunately, couldn't keep up with the times and was surpassed by Internet Explorer in the late nineties. The Netscape browser still exists (under the ownership of AOL), but has fallen into utter disuse. Nevertheless, its influence can still be felt all over the Web. Fragments of its original code, for instance, live on in just about every browser still in production, from Mozilla Firefox to Internet Explorer (click Help/About Internet Explorer in that browser to see for yourself). 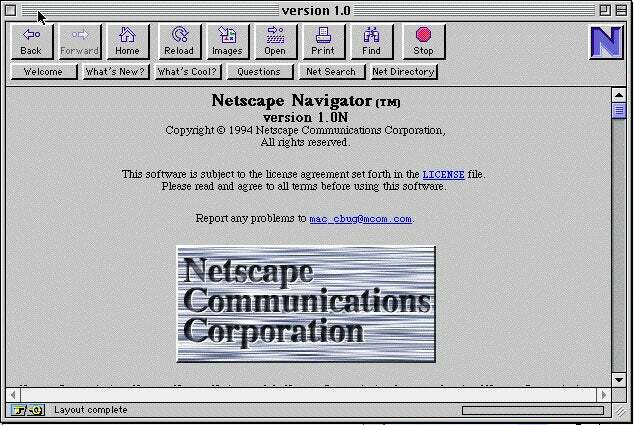 To reminisce about bygone versions of Netscape, check out the Netscape Browser Archive.